Located just 3 hours away from Singapore, Cebu is known for its beautiful beaches and interesting local culture and history. 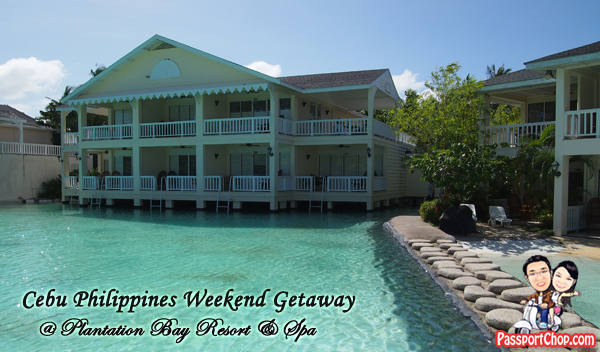 If you are planning a weekend getaway trip to Cebu from Singapore, the Plantation Bay Resort and Spa makes for a great base for you to experience the best that Cebu has to offer. Conveniently located just 20-30 minutes from the Cebu airport, you can avoid the gruelling 1+ hour drive to Cebu City from the airport (which could be longer depending on traffic conditions) by checking into Plantation Bay (located right on Mactan Island where the airport is also based). Plantation Bay Resort and Spa is only 30 minutes away from Cebu City so you can always arrange day trips to Cebu and other neighbouring provinces e.g. Bohol. See PassportChop.com’s Suggested 5-Day 4-Night Itinerary at Plantation Bay Resort and Spa (with day trips to Cebu City and Bohol) for more information of how you can plan a fun and exciting trip to Plantation Bay Resort and Spa in Cebu, Philippines. Upon arrival at Cebu airport, we were greeted by an interesting Plantation Bay display where there are brochures which classify the various rooms of Plantation Bay Resort and Spa by how long you can reach the water e.g. the Water’s Edge Room is listed as being 0 – 2 seconds from the water; the Lagoon Side Room is listed as being 1-minute or less from the water. The reason for such an interesting classification is because the various houses where these rooms are located are built around a huge man-made lagoon! Thus, if you have a room at the Dune House and Chenonceaux House (like ours – see picture below), you can literally step off your balcony right into the man-made lagoon – thus the 0 – 2 seconds! For other rooms around the lagoon, you might need to walk for a few more seconds to 2 minutes to reach the lagoon – still not too bad! 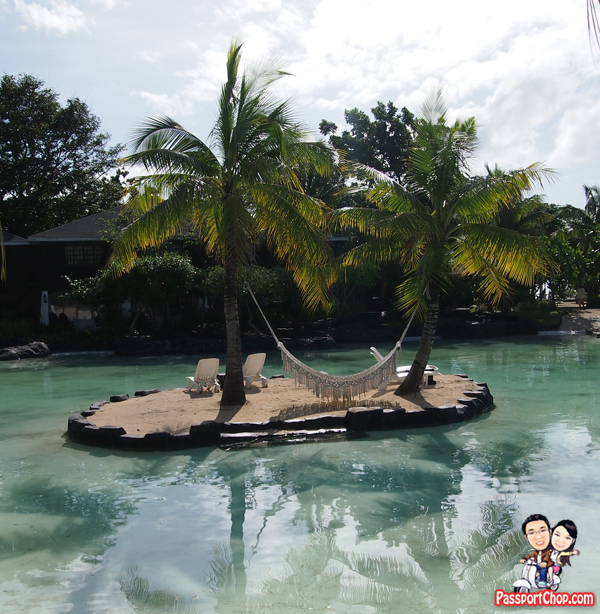 One thing to note about Plantation Bay Resort and Spa is that it is largely a man-made environment. The lagoons have a cement floor. The waterfall is powered by pumps. The rocks around the beach are made of cement or plastic. The beach around the lagoon is also man-made – although the sand is real :-). There is an open-sea beachfront (not man-made – all natural) at Plantation Bay Resort and Spa, which is about 88 metres long – not very long but adequate for some snorkelling around the clear waters for fishes and living reefs. This beachfront is also where guests will take off from for water sports and activities e.g. island-hopping tours, para-sailing but the launch points for these activities are from a jetty quite far from the beach so it is still safe for guests to chill or swim by the beach. Notwithstanding the “artificiality” of Plantation Bay Resort and Spa which is very clearly spelt out on its website page explaining some of the common misconceptions of the resort (http://plantationbay.com/frank-discussion.asp), we still find Plantation Bay Resort and Spa a great place to relax for a short weekend getaway for a variety of reasons e.g. We have been to resorts where tips are expected for almost anything e.g. driving you to another place in the resort on a buggy, room service and restaurants – very frustating especially if you don’t want to carry too much money around the resort (so you can go for a swim without the need to worry about cash being left on the lounge chairs) and furthermore, this adds on to a whole bunch of unexpected expenses in your trip budget planning. Plantation Bay and Resort’s strict no tipping policy is perfect as we can expect great service from the staff and yet no need to fret about how much tips to give and carry cash all around the resort (everything is chargeable to your room!). A man-made lagoon has its advantages too – safety being one of them as there are quite a number of lifeguards on watch at all times during the day (look out for the staff in red shorts) and there won’t be dangerous sea animals e.g. jellyfish swimming around and the pools ain’t very deep (except for the dive rock area). You will also not be swimming against sudden strong currents in the waters as the lagoon environment is controlled – also due to its unique geology and location in the inland Philippine Sea, totally surrounded by much larger islands, the Mactan Island (which Plantation Bay Resort and Spa) is safer than most other resort areas in the world (significantly lower risks of tsunamis and giant waves). I guess – only in a man-made lagoon, you can have your own private island to relax in your own world (like the island below!). 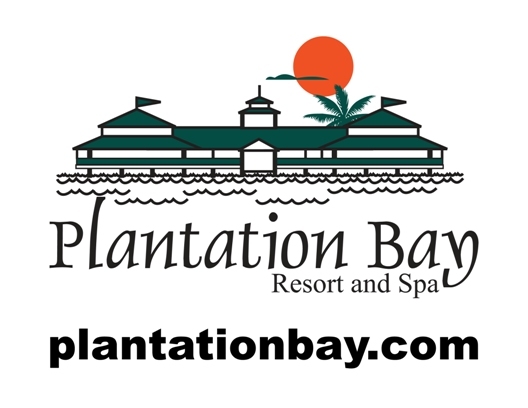 Follow our reviews over the next few weeks as PassportChop will provide a preview of what you can do and expect from your stay in Plantation Bay Resort and Spa e.g. – Different themed breakfast buffet – you will enjoy a different type of breakfast for each day you are in Plantation Bay Resort and Spa; we had experienced Louisiana, Italian and French breakfasts! See PassportChop.com’s Suggested 5-Day 4-Night Itinerary at Plantation Bay Resort and Spa (with day trips to Cebu City and Bohol) for more information of how you can plan a fun and exciting trip to Plantation Bay Resort and Spa in Cebu, Philippines. Spot on with this write-up, I really think this web site needs much more consideration. I’ll in all probability be again to read much more, thanks for that info. Youre so cool! I dont suppose Ive read something like this before. So nice to search out anyone with some original thoughts on this subject. realy thanks for beginning this up. this website is one thing that’s needed on the internet, somebody with slightly originality. helpful job for bringing something new to the web! This site can be a stroll-through for all the info you needed about this and didnt know who to ask. Glimpse right here, and youll undoubtedly discover it. Nice post. I learn something more difficult on completely different blogs everyday. It’s going to all the time be stimulating to learn content material from different writers and observe slightly one thing from their store. I’d choose to use some with the content material on my weblog whether or not you don’t mind. Natually I’ll offer you a hyperlink in your net blog. Thanks for sharing. I like the important information you provide within your article content.I’ll bookmark your website and verify yet again the following commonly.I am very definitely sure I will understand quite a lot of new things best suited right here! Superior luck for that subsequent! Hello there! I just want to offer you a huge thumbs up for your great information you have right here on this post. I’ll be returning to your blog for more soon.